DALLAS — Former UTEP Miner left guard Will Hernandez stirred #CowboysDraftTwitter this past Wednesday when he posted a picture of himself attending the premiere of the remake of Death Wish with Dallas Cowboys tackles La'el Collins and Tyron Smith. Adding Hernandez to the Cowboys offensive line would no doubt solidify it for the next few seasons, but would it be prudent to take another offensive lineman at No. 19 overall? The former Cowboy from Chaparral High School in Las Vegas has power as part of his 6-2, 348-pound frame. So, he would be an asset in pass blocking. But he also has the ability to get in space and be a formidable pulling guard. Our friend Dane Brugler from NFLDraftScout.com has Hernandez at 27th out of his top-50 that he released a week ago. Pretending for a moment that Brugler's list is what teams will use on draft weekend, just because a given player is at a particular spot doesn't mean the corresponding team with that pick will take that player. In other words, USC quarterback Sam Darnold is fifth-best and the Denver Broncos hold the fifth overall pick. That doesn't necessarily mean they should take Darnold. Therefore, Herndandez would probably move up closer to the 19th-best spot in such a list on the evening of Thursday, April 26. The Cowboys, of course, pick 19th. Left guard was problematic for the Cowboys in 2017, mostly due to their insistence that swing tackle Chaz Green should play the spot while career guard Jonathan Cooper should back him up. Cooper, a 2013 first-round pick from North Carolina, did well when he finally got his chance, but the 28-year-old will be a free agent this off-season. He also has battled injuries every one of his five seasons in the NFL. It is a risk to lock up Cooper given that he is advancing in years and already has a significant injury history. It similarly does not make sense to spend first-round capital on the offensive line, an already solid unit with three first-round picks, if the pick can be used in other areas, notably the defensive line. The Cowboys have a decision to make at defensive tackle with David Irving. If the Cowboys let Irving walk this off-season, they must use their first round pick to address defensive tackle with Washington's Vita Vea the best prospect at that spot. However, if Dallas chooses to lock up Irving, then they could have the best offensive line in all of football under contract for the next five seasons. Smith and center Travis Frederick are locked up through 2013, and while Collins' deal expires after 2019 and Martin enters his final year in 2018, Dallas will assuredly extend the latter and more than likely the former. Even if Collins were to depart after the 2019 campaign, the Cowboys would have two full seasons of a dominant offensive line while having quarterback Dak Prescott and running back Ezekiel Elliott still on their rookie deals, which would free up cap space to address the defensive front seven effectively. Hernandez earned All-Conference USA honors in 2016 along with second-team Associated Press All-American honors. 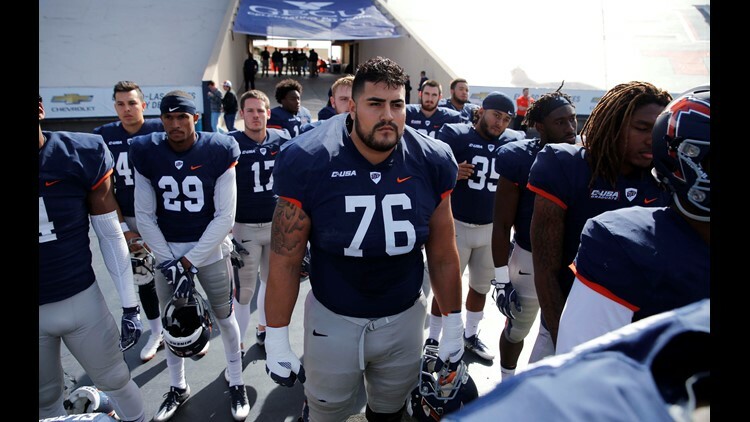 The Miners were 4-20 the past two seasons with Hernandez one of the few bright spots. The redshirt senior, who played all four seasons at left guard, would indeed complete the Cowboys' offensive line. Should the Cowboys continue to build their dominant offensive line with top draft picks or should they look to improve elsewhere? Share your thoughts with Mark on Twitter @therealmarklane.